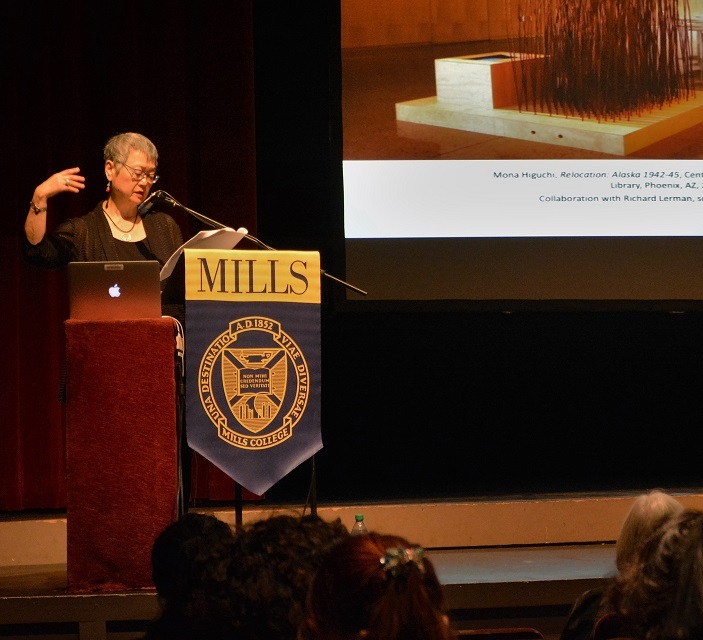 On October 20, 2016 Professor Machida presented “Trans-Pacific Visions: Islands and Oceanic Imaginaries in Asian American Art” for the Jane Green Endowment for Studies in Art History and Art Criticism at Mills College. Created in 1993, this annual lecture series brings outstanding speakers in order to give students and the Mills College community access to a range of significant contributions in the fields of art history and art criticism. In recent years, the list of luminaries that Margo joins, includes Partha Mitter, Martha Wilson, Melissa Chiu, and Jonathan D. Katz. In 2017, Margo Machida will serve as Co-editor of the special issue “Island Words, Oceanic Diasporas, and Global Flows” for the international journal, Asian Diasporic Visual Cultures and the Americas (Brill). The Asian/Asian American Studies Institute is very pleased to highlight our colleague MARGO MACHIDA’s award for research excellence, receiving funding for “Trans-Pacific Connections: Art, Asian America and Asian Australia” from the Office of the Vice President for Research. The 2016 Research Excellence Program Storrs (REP-Storrs) funding cycle was very competitive with only 33 proposals funded out of 104 submitted. Please join us in Congratulating Margo for this signal achievement! Margo Machida delivered the Keynote Address on the topic of Asian American and Transpacific Art to open the Global Asias | Art – Global Art and Diasporic Art in Japan and Asia Symposium that took place June 26 and 27, 2015 at the Mori Art Museum and Tokyo University. Professor Machida was joined in discussion by scholar Jacqueline Lo (Australian National University). The third of a series building on the inter-institutional Global Asia/Pacific Art Exchange initiative, which began in Shanghai, Hong Kong, Canberra, Wollongong and Sydney (2013) and Washington DC and New York City (2014), the Tokyo University symposium is the result of a collaboration between the Asian/Pacific/American Institute at NYU and the Mori Art Museum. Participants covered topics from the national to the global and the planetary, from a history of Asian American and other diasporic Asian art to current global tendencies. Global Asias | Art invited scholars, arts professionals and artists to engage in a critical look at the field in response to the concept of Global Asias including the conceptual intentionality, possibility and limits of these frameworks. Margo Machida gave a lecture “Trans-Pacific Visions in Asian American Art” at Bard College on contemporary artists in and from Hawai’i and the Asia Pacific region that is co-sponsored by the departments of Art History, American Studies, Asian Studies, and Religion. Her talk on October 28, 2015 was organized by Professor Tom Wolf, art historian and leading Kuniyoshi scholar who recently curated the exhibition, “The Artistic Journey of Yasuo Kuniyoshi” for the Smithsonian American Art Museum in Washington, DC. Professor Machida recently co-organized – “Geography of the Imagination: The Island” — at the College Art Association’s annual conference in New York on February 13, 2015. Sponsored by the Diasporic Asian Art Network (an affiliate society of the CAA), the panel introduced the thematic of islands, oceans, and trans-Pacific flows as a way to situate Asian American art in different global and comparative contexts. On February 27, 2015 she was also invited to serve as panelist with musician/composer Vijay Iyer and University of California – Davis Asst. Professor Grace Wang at a conference aimed at revitalizing Asian American Studies at Yale (New Haven, CT) hosted by the College’s Asian American Cultural Center.